Lamping has revolutionised controlling foxes. More foxes are shot in the lamp than are killed by all the other methods of fox control put together. It is straightforward: see the fox, get into position, and take the shot. The only downside to lamping is that when you miss, you rarely get a second chance. Foxes that have been shot at and missed become lamp-shy almost immediately. Next time the beam touches them they’re off and running — the only way to catch up with one that has become wise to the lamp is to try something else. Here are some of the options when your missed lamping has created a wilier fox. This is my first line of defence if I have a fox targeting one of the pens or hunting partridges around a covercrop. 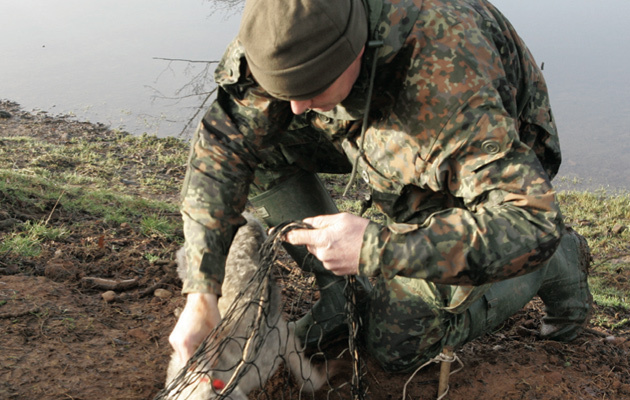 Snares are easy to set and fairly cheap to buy. You don’t need many if you’re targeting an individual fox but what you do need is a little bit of fieldcraft. 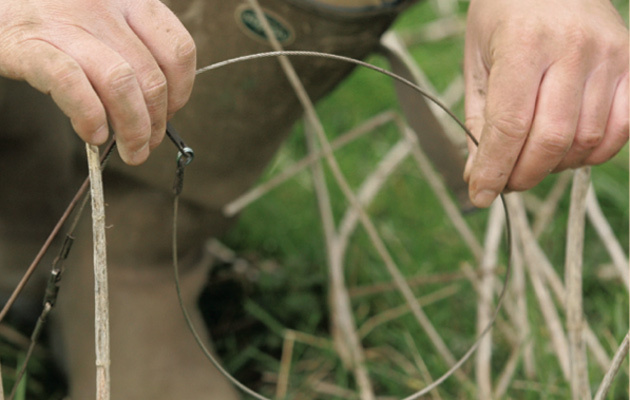 Half-a-dozen snares set on proper runs will catch far more than 20 set in gaps in the hope that something goes in. A lamp-shy fox will hunt the same patch of ground most nights so if you can find a decent run leading into one of his favourite fields you’re on to a winner. Find a spot where the run goes through a patch of rough grass or light cover and set the snare where the run is at its narrowest – this will help to guide the fox into the noose. If a fox goes in but manages to get out, re-set the snare 30 or so yards away but on the same run. There’s every chance you’ll catch him again because a fox that has been in a snare doesn’t actually know what it was caught by, so it associates being caught with where it happened and not with the snare itself. Before lamping became popular, most shoots used to hold fox drives. They’re still a useful form of control and are especially good if you have a lamp-shy fox and happen to know where he’s lying up. Big gangs of beaters and lots of Guns are hard to keep quiet and get in place without alerting the fox, which is why I prefer to have just one or two lads who know the ground drive a patch out towards me and possibly one other Gun. Older, wiser foxes (which are usually the ones that are lamp-shy) don’t take much moving and generally follow the same line out of a wood or patch of cover. This makes them easier to intercept once you’ve driven a patch once or twice and know the way they’ll run. When a wood is being driven towards me I’ll stand inside the wood on a run and make sure I’m up against a tree or have something behind me to break up my outline. Then I wait until the fox is really close before shooting it with a heavy load. If it moves once it’s been knocked over I immediately give it another barrel to be on the safe side. High seats are very effective for catching out wary foxes if they’re in the right place, which is why the small portable ones that can be carried or tied to a quad bike are so good. The advantages to sitting on a high seat over sitting or standing on the ground are twofold: firstly, scent is carried off over the head of the fox we’re waiting for, and secondly they offer a better field of view. A relatively low seat, where you’re sitting just 10ft off the ground, is high enough to carry your scent off and for you to be able to see into a plantation or field that would otherwise be screened off by cover if you were standing or prone. A high seat is also safer if you’re using a rifle as the bullets will be driven into the ground. Set one up on the edge of the field or patch of cover where you’re seeing the fox at night, and sit in it until it’s too dark to see through the scope before coming home. It is often in the last few minutes of daylight that they make an appearance. If you’ve tried driving a patch of ground for a lamp-shy fox and are convinced it is there, but have had no luck, there’s every chance that it has gone to ground. Get someone with a terrier to check out all the likely looking holes, drains and hollow trees and see if they can find it and get it to bolt either into a net or to a waiting Gun. It’s also worth looking up the older trees, especially ones with a slight lean to them and the ones covered with ivy, and running the terrier through bales, even if they’re close to the farmyard itself as they are another favourite place for them to lay up out of the wind. Working terriers to ground controlling foxes for the protection of gamebirds is legal and a great way to catch up with an old stager who knows the meaning of the lamp. Everyone I know with a night sight swears by it. They’re useful for shooting lamp-shy foxes because Charlie never knows you’re there. Those that have one tend to use it in one of two ways — as a replacement for a lamp where the fields are scanned for foxes, and any seen are either called in or stalked where they are, or for spotting foxes coming towards them when they’re sitting waiting by a pen or on the edge of a wood. One friend of mine sits out near his birds with his terrier and waits for the dog to get excited (which it does when it smells or sees a fox) before looking through the sight and shooting the fox as it prowls around the outside of the pen. Like many of the lads, he has his night sight mounted on a .22 rimfire because he is shooting so close to pens and doesn’t want to disturb the birds or push them off roost with the report from a centrefire rifle. A .22 would be on the small side for shooting foxes under normal circumstances but the ones he shoots with the night sight don’t know he’s there — they’re shot at close range and he has plenty of time to put his shot in the right place.